Camp New Hope's Summer Camp Program is an overnight week-long summer camp experience. Camp is available for campers aged 8 years old and older. Camp weeks are offered throughout June and July (with one week of day camp the week of July 4), each with a special theme, special guest performances, and custom-themed activities and foods. Camp is filled with arts and crafts, music, and recreational activities, all adapted to individual campers' needs. Swimming, boating, sports and tournaments, fishing, and nature education fill camp days. Evenings conclude with group activities such as games, sing-alongs, and stories and camp weeks culminate with an award ceremony for campers, parents, and families. Camp New Hope's Summer Camp lets special needs campers experience everyday activities such as slumber parties, camping, boating, and fishing, just like their non-disabled peers. 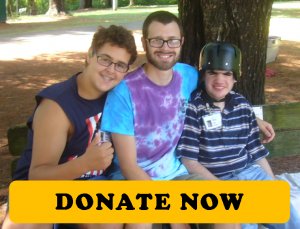 Camp New Hope adapts activities to each camper instead of the individual adapting to the activity. Summer Camp Staff to Camper ratio is daytime: 3 staff to 10 campers, nighttime: 2 staff to 7 campers. Camp New Hope is undergoing some reconstruction in regards to summer camp forms. We are moving to online registrations in a big way with a new high tech database system called CampMinder. Jill has been working on this process for about a month now but the going is much slower than we anticipated. Currently, we are hoping to have everything launched by Feb 15, 2018. Parents will be able to do the paperwork online and the best part after this first year, answers self populate so corrections is all that is needed going forward. This is a big step and the more online that we do the better the system will be. Don't worry parents we are here to help if you are not tech savoy as well. More information to come so just keep checking. Thank you for being patient with us. -Individual refers to camper's reside at home with family or on own. -Group refers to camper's who reside in a CILA, or group home. If cancellation occurs for a physician-documented medical reason all fees, MINUS the deposit will be refunded. Or camper can choose a later week to attend camp if space is available. If during a session it is advised to send a camper home for medical reasons, the remaining portion of the session will be refunded. No refunds will be made for late arrivals or early departures. In case of homesickness, dismissal, or voluntary withdrawal there is NO refund of any fees.